We had a winter break in the sun over the Christmas period. On the first day we headed straight to the beach and pool and didn’t step back in to our room until late afternoon. Our room had been cleaned and made-up in our absence (such a treat on holiday). 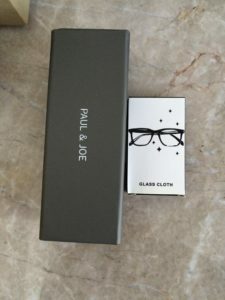 To my surprise there was a nicely packaged cleaning cloth next to each of my glasses cases. I always travel with at least four pairs of glasses – two clear glasses, one pair of prescription sunglasses and one pair of normal sunglasses for contact lenses. Each of my cases was arranged neatly on a surface with the company of a glossy new cleaning cloth beside them. As a glasses geek, I was delighted! It prompted me to immediately clean all my glasses so they were sparkling and ready for the next day’s assault from sun cream, sand and sea spray. I thought that this was a lovely touch from the hotels housekeeping team. It turned out to be a critical yet nonessential detail which made this hotel memorable for me. You should always keep your glasses clean to avoid wear and tear. To learn more or to purchase lens cleaners, pop into our store or give us a call on 020 7586 5508. Celebrate Healthy Sight Month this February Shopping habits: how are they influencing your purchases?